Lexington, Ky.—Jan. 29, 2019—Following a record year of participation in the Green Hunter Incentive Program, the U.S. Hunter Jumper Association is pleased to bring back the USHJA Green Hunter Incentive Regional Championships as an added benefit to enrollment in the USHJA Green Hunter Incentive Program. In 2019, enrolled horses will be eligible for national awards and money-won tracking lists, participating in a Regional Championship, and the chance to qualify for the Platinum Performance/USHJA Green Hunter Incentive Championship in Lexington, Kentucky. "We are so pleased with how these regional championships were received last year, and we're excited to see more competitors participate this year," said Ron Danta, chair of the USHJA International Hunter Derby and Incentive Task Force. "The incentives in this program really reward owners and riders bringing up green horses that represent the strong future of our sport for juniors and amateurs." Enrollment in the USHJA Green Hunter Incentive Program is open to horses that are eligible to compete in Green Hunter 3', 3'3", 3'6" or 3'9" sections. Exhibitors may enroll horses for $350 through February 1. On February 2, the price increases to $550 until June 1, and after June 1, the price increases to $750 for the remainder of the year. Horses must be enrolled in the USHJA Green Hunter Incentive Program to participate in the Green Hunter Stake classes, one of five regional championships, and to be eligible for the Platinum Performance/USHJA Green Hunter Incentive Championships. Horses that have participated in the program at the 3'0 or 3'3" level in previous years are eligible for a one-time discount of $100 off the enrollment fee when they are enrolled at the 3'6"/3'9" level. "Throughout this program, the task force has considered ways to incentivize participation and support owners and riders who are focused on developing horses for our sport," said Danta. "I would encourage anyone with a green horse to enroll and take advantage of all the opportunities the program provides; every pay out makes a difference when you're bringing along horses." The primary benefit of enrolling in the program is access for horses to compete in the USHJA Green Hunter Incentive Stake Classes, which are offered this year already at more than 290 competitions across the country. More competitions add the Incentive Stake Class on a rolling basis throughout the year. The full schedule can be accessed at www.ushja.org/GHICalendar. Each class offers a minimum of $1,000 in prize money when held at a Premier or National competition or a competition that has been approved for a Special Competition status, and a minimum of $500 in prize money when held at a Regional I or Regional II competition. 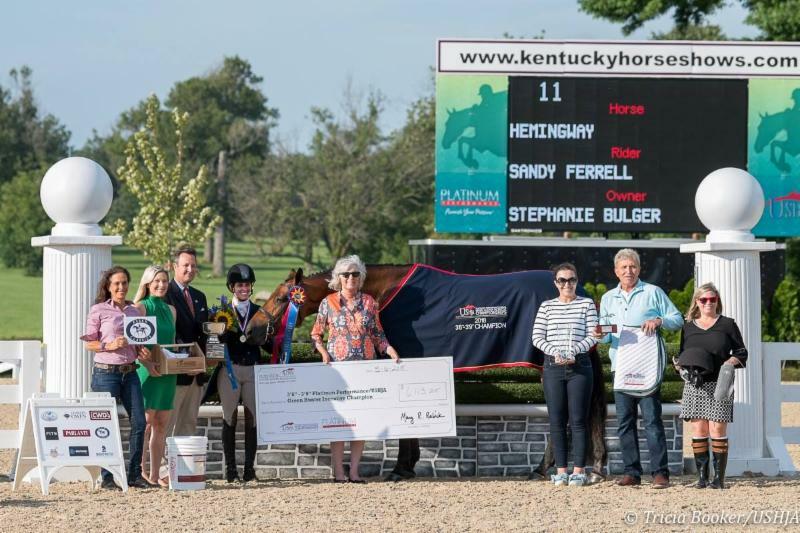 The Platinum Performance/USHJA Green Hunter Incentive Championships will take place August 13-15, which is the same week as the Platinum Performance/USHJA International Hunter Derby Championship at the Kentucky Horse Park. Last year, the Championships offered more than $260,000 in prize money over the three days of competition, which were divided by fence height, offering a 3'/3'3" section and a 3'6"/3'9" section. The USHJA Green Hunter Incentive Program offers a Rider Ranking System for owners to earn additional prize money based on how much money their horse's rider has won in the program in prior years, favoring those riders with less money-won in the program. Use of the Rider Ranking System is optional in Stake Classes and Regional Championships but is a key offering at the Platinum Performance/USHJA Green Hunter Incentive Championships each year. Within the Green Hunter Incentive Rider Ranking System, riders are categorized each year into two tiers based upon their prior earnings within the program. Tier I riders are those who are ranked 1-30 in money won in the USHJA Green Hunter Incentive Program over the past three years, and all other riders are considered Tier II. Owners of horses ridden by Tier II riders may be eligible to earn additional prize money at the Championships in Kentucky, and USHJA encourages competition managers to offer additional prize money to owners of horses ridden by Tier II riders in stake classes and regional championships. Horses ridden by Tier I riders are not eligible to earn Tier II prize money. Learn more about the USHJA Green Hunter Incentive Program and enroll at www.ushja.org/GreenIncentive.